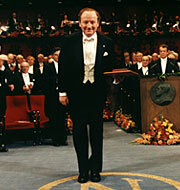 In 2005, HBS Professor Robert Merton generously donated his 1997 Bank of Sweden Prize in Economic Sciences in Memory of Alfred Nobel to Harvard Business School. Awarded for the development of the Black-Scholes-Merton Formula to determine the value of derivatives, the Nobel Prize Medal, Diploma, and related materials are on permanent display in the de Gaspé Beaubien Reading Room on the first floor of Baker Library | Bloomberg Center (directions). The Nobel award honors not only the formula but also the spirit of curiosity, creativity, and collaboration that characterized its development and continues to inform its evolution and application today.